Experience the magic of sitting in Sacred circle with your sisters and brothers to unite your hearts, share your unique Medicine, sing your songs and ultimately contribute to the higher good. This work will be enhanced by the ancient plant medicine Cacao bringing in the energy of the Divine Mother with integration through sacred sound. 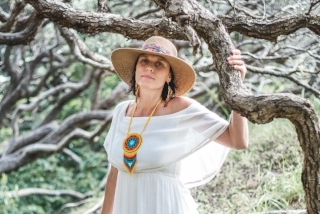 Join Shamanic Practitioner Maren Lander for an afternoon of meditation, intention, prayer, song, Shamanic journeying and sound healing. You will know if it is time to re-ignite the fire in your heart so you can step up courageously and skip joyously towards new creations in your life. This circle will be the perfect place to do so. Please let us know beforehand if you are pregnant, suffer from a heart condition or take anti depressants.